Poets Knotbrook Taylor, Catriona Yule and Haworth Hodgkinson, with dancer Mhairi Allan and projectionist David Liddell, gave a short performance as part of a showcase of new writing at the Aberdeen Arts Carnival. The performance combined poetry, live music and dance with projected images. 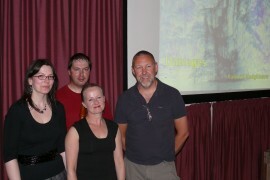 The showcase also featured writers from many of the writers' groups based in Aberdeen and North-East Scotland.